Twenty years ago, the chances of watching an NBA game with commentary in a language other than English were small. Today, the NBA transmits games in 47 languages to 215 countries across the world. This is a perfect example of how organizations have evolved over time to meet the demands of their audiences. Evidence like this is the reason many government agencies have launched social media accounts and other digital content dedicated to a Spanish-speaking audience. 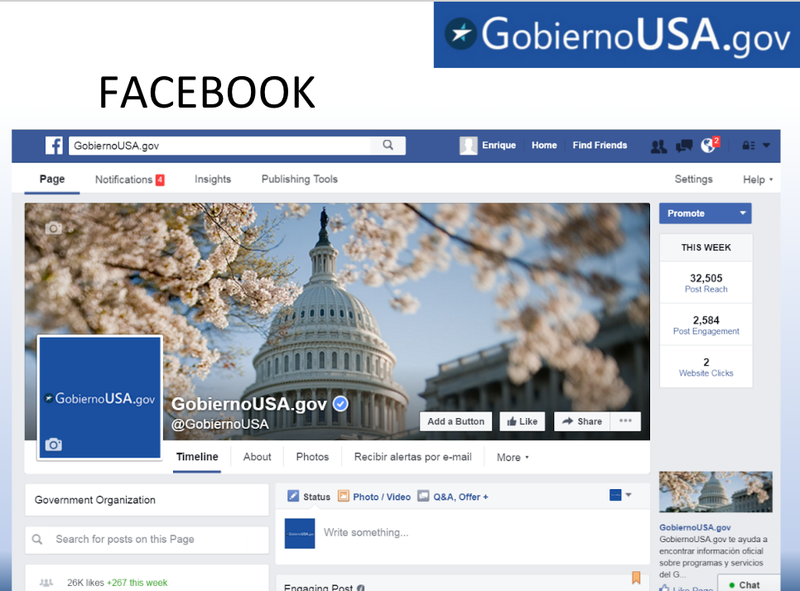 At USA.gov, we launched our Spanish-language website GobiernoUSA.gov in 2003 (at the time it was called FirstGov en espa√±ol) and launched separate social media accounts in English and Spanish in 2007. If you or your parents were born in a Spanish-speaking country and then came to the United States, odds are you speak at least a little bit of “Spanglish.” You probably feel comfortable moving between both languages and may not even notice when a hybrid Spanish-English word or phrase slips into your conversation. Communicators trying to reach this growing market segment need to have a plan for how to effectively reach this audience. We’ve seen some examples of this in government already in recent Twitter chats where hashtags have been a mix of Spanish and English words. For example, the Department of Health and Human Services (HHS) has held several Twitter chats using the hashtag #OurSalud. But we’ve yet to see a cohesive strategy for the best way to approach this. So, we’re launching a small pilot program on the GobiernoUSA.gov and USA.gov Twitter accounts where we experiment with bilingual tweets. The large majority of tweets from the GobiernoUSA.gov account will still be in Spanish, but we plan to mix in some English-language messages that we know will resonate with the bilingual audience. From the USA.gov account, most messages will be in English but we will retweet messages in Spanish when we know the topic might resonate with the Hispanic audience that consumes information in both languages. For example, recently USA.gov retweeted a GobiernoUSA.gov tweet about applying for passports. Communicating in English through a Spanish channel goes beyond a simple translation. It’s about creating messages for a specific target audience. Much like you consider audiences made up of mothers under 40 or men over 50 when you are drafting content, you should consider the Hispanic millennial as a target audience. This audience benefits from English messages through Spanish channels. 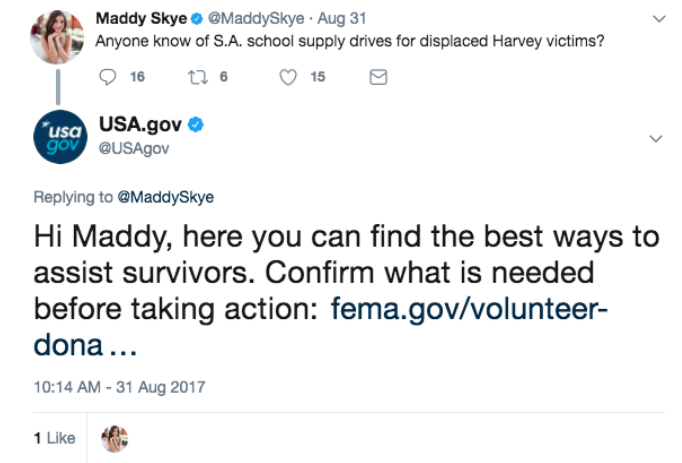 In the public sector, some Spanish-language accounts, such as HHS Latino and La Casa Blanca, occasionally post content in English. This “Spanglish” approach is a powerful way to attract a growing audience that moves in between two languages and cultures. This audience might consume information mostly in English, but often they share information in Spanish with friends and family members. Additionally, there are concepts that are better said in English, especially to an acculturated audience. By translating these concepts you could, in fact, be adding a barrier to message delivery. Our GobiernoUSA.gov accounts try to tackle that conundrum by going beyond translating content. We aim to connect two audiences that have many things in common through a specific communications channel and engage in a real conversation. Spanglish is here to stay, and a more refined version is coming. You will gradually see more English words in Spanish messages and English messages in what were once “Spanish-only” channels, as more organizations adapt to the demands of this growing audience. Jessica Milcetich, Leilani Martinez, Victoria Wales and Edgardo Morales are all part of the USAGov Marketing Team.